Diana, Alexa, Valimina — Flute trio. This melody was originally composed around 1600 by German organist Hans Leo Hassler for a secular love song, “Mein G'müt ist mir verwirret”. 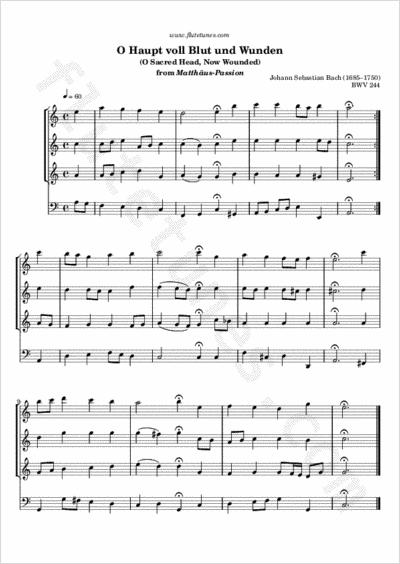 The most famous setting of the tune, however, is by Johann Sebastian Bach, who arranged it in his St. Matthew Passion. Bach also used the melody on different words in his Christmas Oratorio, both in the first choral and the triumphant final chorus. As many will probably recognize, The melody of “American Tune” by Paul Simon is based on this tune. Thanks to Diana for suggesting this piece!